SSE Makes Quite a Buzz! Since November of 2012, Students for a Sustainable Earth Co-Chairs, Weston Hillier and Nicholas Wikar, have been hard at work authoring a Student Sustainability Grant proposal with the assistance of entomologist Dr. Lawrence Connnor to install six honey bee hives on the campus of Western Michigan University in an effort to conduct long-term apiary research. The installation would be(e) the first-of-its-kind at WMU, and would allow students to gain bee keeper training, investigate phenomenon such as colony collapse disorder (CCD), and examine the potential benefits apiary populations would have on student-led garden and horticulture initiatives. As this is the first SSG proposal submitted to exceed $10,000, since the program’s inception, a resolution of support from the Western Student Association (WSA) Senate is also needed before approving the project. To accomplish this task, SSE Senator Cody Hodges, member Kyle Martin, and Wikar authored a draft resolution and submitted it to WSA’s Office of the Speaker on February 5th, 2013. The draft resolution was accepted by Speaker Neldon and will be presented as “read only” when the Senate meets on Wednesday, February 6, 2013. The authors are also seeking the sponsorship of WSA’s Sustainability Committee ahead of the resolution’s formal presentation, discussion, and vote by the Senate expected on the afternoon of Wednesday, February 13th. “Our hard work is paying off, and I am very excited to be a part of such valuable research that is sure to advance sustainability efforts at Western Michigan University. We are just getting started, but we would not have gotten this far if it wasn’t for everyone that has and continues to come together to make this dream a reality,” said Wikar. Click on the links below to view the draft and read only versions of the resolution. 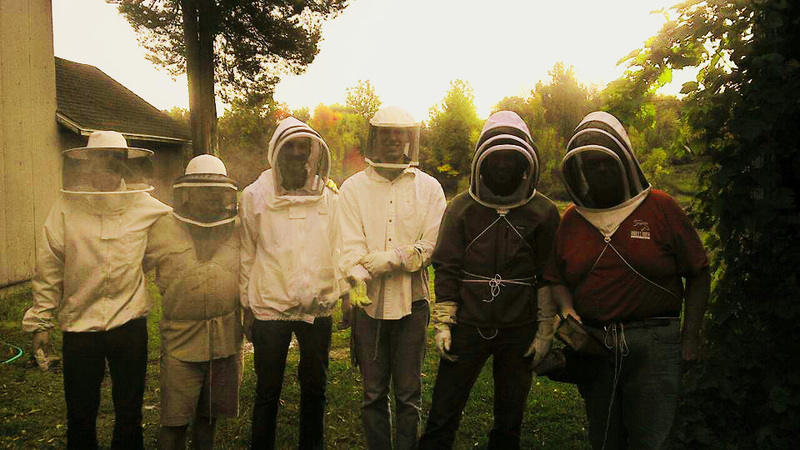 Getting a first-hand look at bees-in-action, October 2012. Pictured Left to Right; Joe Szuszwalak, Jr., Cody Hodges, Nicholas Wikar, Kyle Martin, Weston Hillier, and Dr. Lawrence “Larry” Connor. If you didn’t already know, we are off to a busy, busy start! Please, mark your calendars and be sure to attend the following events! 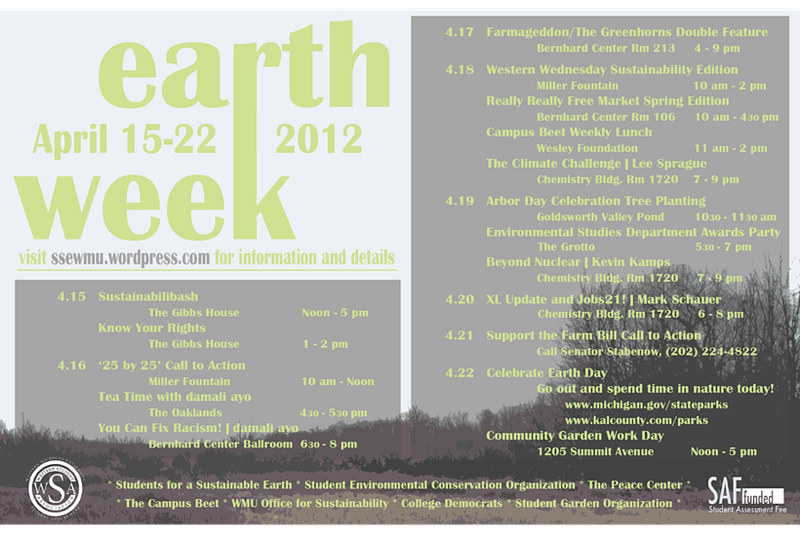 Be there this Friday as we unveil the branding for Earth Week 2013 and host the first of many planning meetings. Groups and individuals interested in collaborating with SSE to make this year’s Earth Week a success should try to attend as we will be finalizing the schedule of events. Students for a Sustainable Earth and the Kalamazoo Peace Center are proud to be hosting environmental organizer Lauren Swaddell for an educational event about Horizontal Hydraulic Fracturing. This highly controversial method of extracting natural gas is practiced in Wyoming, Pennsylvania, Ohio, New York and is now coming to Michigan. This presentation will explain the process and how it has affected people and land in upstate New York while also covering extreme extraction methods such as arctic and deep water drilling. Members of Shale Shock will be hosting a training on coalition building the day following this event. Fall 2012 Update – Welcome Back! SSE is already off to another great start! In case you missed our first meeting on September 13th, we are now meeting bi-weekly on Thursdays, 7:00-9:00pm in Rm. 205, Bernhard Center. Students are reminded to also check GoRSO for updates and a live calendar of upcoming meetings, events, and speakers. Keep an eye on the events calendar for a complete list of meetings and events coming soon. Those interested in being a guest speaker or presenting an initiative to our members should consult this calendar for openings prior to submitting a request to be added to the respective agenda by email. Next Regular Meeting – Tomorrow, September 27th @7pm, w/ Patrick Rhea on behalf of Mike O’Brien for Congress and Dr. Larry Connor; entomologist, beekeeper, and author. 2012-2013 SSElections – Thursday, October 11th @7pm. Click here to nominate yourself or others to the SSEboard. Earth Day – get outside!! Join us for Free Food, Free Movie, and Free Thought! Bring a friend (or 5) for a screening of the environmental film “Home” in addition to a discussion afterwords on current environmental challenges. JOIN US! 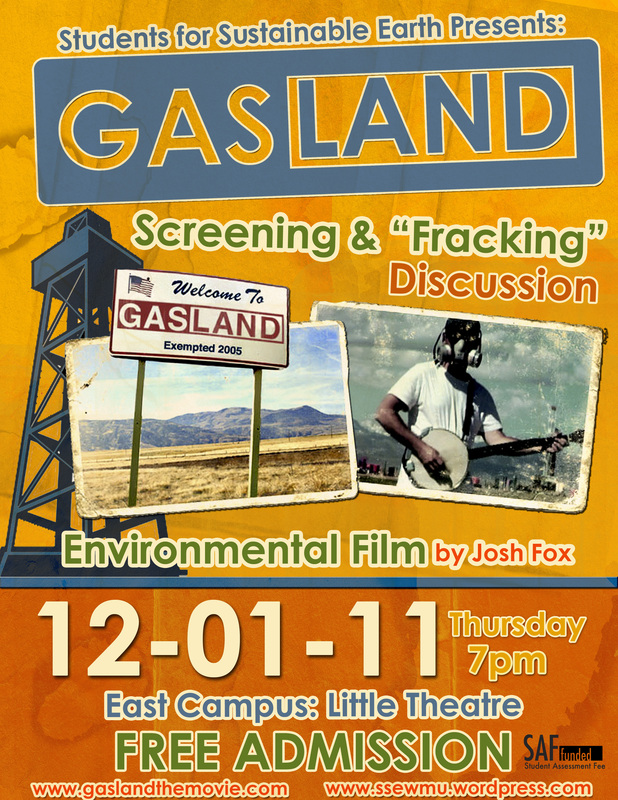 Students for a Sustainable Earth will be showing “Gasland” an environmental documentary highlighting and exposing how natural gas is extracted from the ground, and how dangerous these methods are to people and the environment. 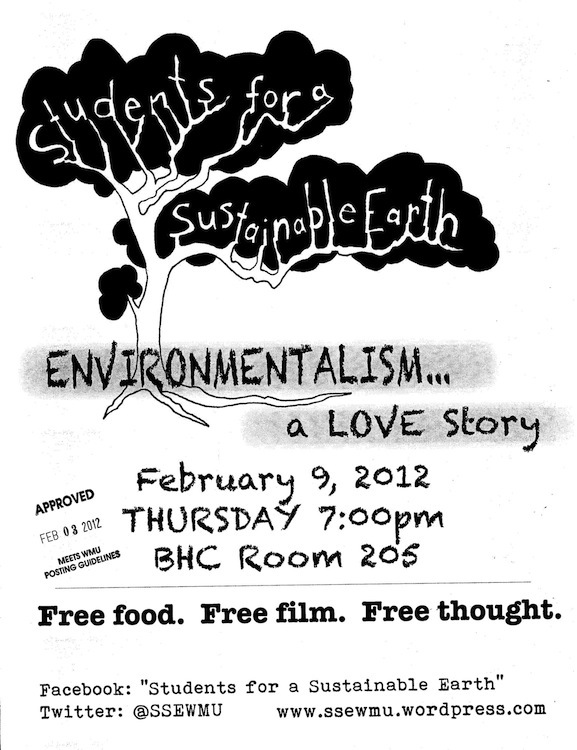 Following the movie will be a short discussion on the topic of natural gas and energy production. ALL are welcome to our meetings, we are not an exclusive group – if you have never been to a meeting before we would love to have you. Follow SSE on social media!